L to R The Hon Ben Carroll MP, Minister for Industry and Employment, presents the Victorian Training Awards Employer of the Year to Tom Cooper, Operations Director, PACCAR Australia. 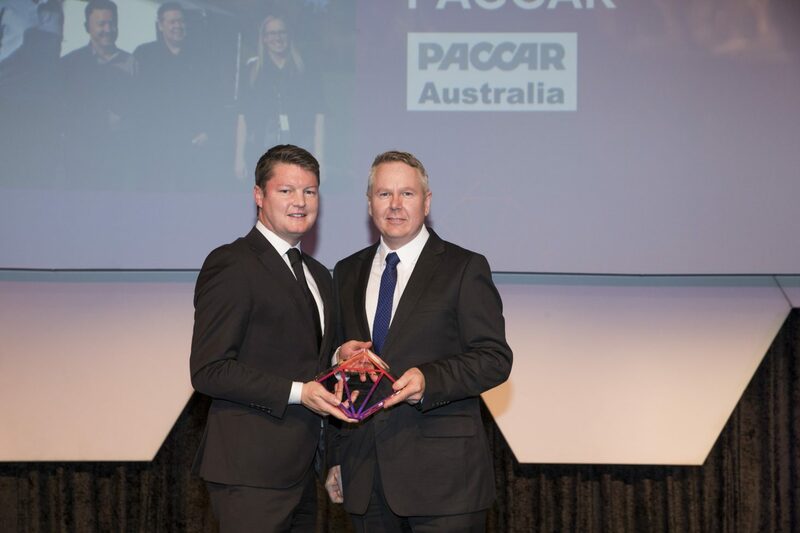 PACCAR Australia has been honoured in the Employer of the Year category of the prestigious Victorian Training Awards for 2018. PACCAR Australia is an automotive manufacturer that produces worlds-best trucks, contributing to local and national manufacturing employment opportunities generating direct and indirect employment that extends from staff, to suppliers, dealer network and customers located throughout Australia, New Zealand and Papua New Guinea. PACCAR Australia is committed to providing new investment and manufacturing capabilities in Australia, backed by its parent company, PACCAR Inc.
At the recent launch of the first Australian assembled DAF truck to come off the production line in Melbourne, www.daf.com.au/2018/08/21/historic-first-daf-truck-assembled-australia , it was announced that, over the next three years, PACCAR Australia will double the size of its Bayswater plant. Investment on this scale sends a clear message to employees, the dealer network, customer base, and the road transport industry at large, that PACCAR Australia is committed to manufacturing and assembling for the long term. So proud to have worked there for 33 years before retirement,Wish I could start it all again.